Mr. Mark Gentilin, the Owner of Maple Heating LTD, recently visited L P International Inc. and was enthusiastic to share anecdote after anecdote about his experience with PowerMate stair climbing hand trucks. Many included his Customers watching in amazement, some even taking photos of Mark working with his PowerMate. The following provides just a glimpse of Mark’s experience with the PowerMate stair climbing hand trucks over the past 5 years. For over 35 years PowerMate has been proven to safely and efficiently help people in Elevator Service and Modernization Industry. Elevator technicians have benefited from PowerMate Solutions to help provide safety moving solutions for items like; sheaves, motors, armatures, generators, controllers, drums, spools of cable, tool boxes and more. Today, PowerMate is proud to announce another industry leading solution created to assist technicians with the movement of test weights! NEW Lifting Solutions for Today's Vehicles! The team at L P International Inc. the manufacturer of PowerMate stair climbing hand trucks and LiftGates have introduced two new products to assist customers working with smaller more efficient service and delivery vehicles. First – the NEW PowerMate LV-2 LiftGate! Water Heater Tank Moving Solutions! Amended Standards for residential water heaters implemented by the U.S. Department of Energy (D.O.E.) took effect April 16th, 2015. New residential water heaters are now required under the new Final Rule to perform to a higher energy factor (EF) rating. The new rule applies to nearly all residential gas, electric, oil and tankless gas water heaters. To achieve the desired EF rating, one of the impacts of this new rule is many of the new tanks are now physically larger. There has never been a better time to implement a PowerMate Stair Climber and/or LiftGate solution to help save you valuable time and money when tasked with moving both residential and commercial sized tanks! Based on more than 35 years of experience, the following are two of the most popular PowerMate stair climber solutions for safely and efficiently moving hydronic products including, hot water tanks of all sizes. You are invited to choose from one of these proven solutions or customize your own based on your specific needs. Operator training by factory trained personnel is always strongly recommended by the manufacturer for all PowerMate Stair Climbing Models and applications. You are invited to contact PowerMate today to learn more and confirm which PowerMate safety lifting solution is right for you and your business. Visit our Residential Water Heater Changes - Be Prepared! Blog for earlier background material! For more than 35 year L P International Inc., the manufacturer of PowerMate®, has been continuously evolving with the changing needs of the market required to meet the demands of their customers around the world! The PowerMate® range of products, value-added accessories and service grows almost daily as they strive to provide the best and safest solutions for lifting and moving heavy loads. 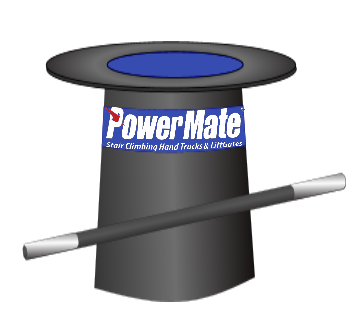 Interestingly, customers find PowerMate® on the web using search terms such as, "Hydraulic Stair Climber", "Electric Trolley", "Automatic Hand Truck", "Step Walker", "Powered Lift", "Powered Appliance Dolly", "Motorized Cart", or "Stair Crawler"! These few search terms do not even begin to address the combination of words and phrases people use to find PowerMate®, including other languages from all around the world. It does not really matter how people find PowerMate®, what is important is they do - period. Stairs Are Not the Enemy! - "Hand Truck Tips & Tricks"
Climbing up and down stairs with a hand truck can often present a unique set of challenges for the operator that can vary greatly from day to day and job site to job site; do your homework and be prepared! Know the capabilities and limitations of your hand truck and how best to deal with challenges you may encounter on the job site! Stairs can vary greatly between different locations around the world and even from job site to job site. There are interior and exterior stairs; and stairs made of wood, iron, steel, perforated steel, marble, stone, tile, etc. At a very basic level, characteristics they all share are a width, a rise (height), and a run (depth). For newer construction, most stair dimensions are controlled by local building codes. Dimensions for stairs can vary significantly between regions and even within them. Many irregular sets of stairs are allowed to still be in use as "non-conforming" exceptions due to their age and construction pre-dating the current building code regulations. What you can be assured is that at some point you will encounter irregular, non-uniform, broken, missing, or suspect steps and will be challenged to negotiate them with your hand truck and load. Not all stairs were created equal! Today, many safety conscious medium to large organizations make a pre-delivery job site inspection part of their normal routine to ensure they are prepared for any eventuality they may have to face. While this is "best practice" and highly recommended, it is not always realistic for everyone, so what do you do? With a PowerMate® dolly, you have a 40" or 101.6cm drive screw. This drive screw, when opened, separates the toe plate and load from the wheels, unlike hand trucks where the wheels and toe plate are fixed. By opening the PowerMate® frame, the operator can create a larger "span", enabling the operator to skip a missing, suspect or broken step and help them negotiate a step having a rise up to 48" or 121.9cm! With PowerMate® all steps do not have to be there or have a uniform rise and run. This unique ability to expand the machine's frame is a feature found on all PowerMate® stairclimber models. It is also what allows the PowerMate® to be used as a dock leveler, curb jumper, and tailgate lift by treating those moves as "one big step". PowerMate® is 4 machines in 1! Remember, PowerMate® stair climbers come complete with non-marking wheels and a full-length bottom rubber guard to protect floors and stair constructed out of just about any kind of material. TIP: When your bottom rubber guard begins to show signs of wear, take 5 minutes, remove it from the bottom of the PowerMate® stair climber and reverse it. By using the other side of the guard you are effectively doubling the life of the guard. Review your route and formulate a plan to complete your move safely and efficiently. If a step does not look as if it would hold your weight, it probably won't support your hand truck and load, so plan accordingly. PowerMate® does not require contact with every step. If a step is broken or the tread is suspect or missing, plan to skip it or use a PowerMate® Step Extension. Remember the PowerMate® drive screw mechanism allows the operator to climb any one step up to 48" or 121.9cm. Plan to place the wheels in the safest/most secure position on the stair tread. With PowerMate®, you have the option of anywhere on the stair tread from front to back. PowerMate® shoe style wheel brakes not only reduce operator effort but create a larger surface and spread the weight of the machine and load over a larger area. This is a valuable option, especially when dealing with older steps. With a little bit of planning, PowerMate® can assist you in safely negotiating just about any reasonable eventuality you may encounter on your job site! To learn more about the safety advantages of PowerMate® today! Moving on Slopes & Ramps - "Hand Truck Tips & Tricks"
For more than 35 years, L P International Inc., the manufacturer of PowerMate, has worked with their customers providing custom safety lifting solutions for moving loads up to 1 500lb or 680kg. Over the years they have developed many different value-added solutions and discovered even more ways to make moving heavy loads safer, easier, and more efficient; some may even say, "Magical!" If you have ever used a hand truck of any kind to go up a slope or ramp into a vehicle, then you know first-hand this can require a significant amount of effort and energy for the operator. PowerMate can help! While this may not be the fastest way to get to the top, you can do it safely, with less effort, and with the operator or operators 100% in control of both the machine and the load. PowerMate trainers endearingly refer to this technique as the PowerMate Crawl. The second application for this technique can be a real life saver! If you have ever been stuck in snow, mud, or sand with a conventional hand truck you can relate. By using the PowerMate Crawl technique, outlined above, you can get yourself out of just about any "sticky" situation. The repeated opening (making larger) and closing (making smaller) of the PowerMate frame as detailed above will ensure you should never get stuck, despite the terrain. For the heaviest of loads, you will find the M-Series Wheel Brakes create more stability and further reduce the operator effort by as much as 30%. The Wheel Brakes create a larger surface area; especially helpful when you are bearing down to close the machine going up a grade. This does not require a great deal of explanation. PowerMate offers the option of either hand operated wheel brakes or "shoe" style wheel brakes for all their stair climbers. What many people are unaware of is: the most common way PowerMate users slow down or stop on a slope or ramp is with the help of the "open" button on the PowerMate! By pressing the open button and making the frame larger, the toe plate will touch the ground and act as a brake, slowing down or stopping the machine on grade. This braking technique works for any PowerMate stair climbing model, with or without wheel brakes, big wheels, and even the retractable dolly in place! PowerMate stair climbers feature a full length bottom rubber guard. This unique bottom rubber guard not only offer the advantage of protecting flooring surfaces of all kinds, but when descending slopes and ramps, acts as an ideal brake! Sometimes the simplest solutions can work the best! Keep these "tricks" in mind he next time you are challenged with moving up or down a slope or ramp. PowerMate recommends practising these techniques yourself so that when you need them, you will be confident and proficient in how to use them. Interested in learning more tips and tricks? Check back to the PowerMate Blog for the next post on the topic, or better yet, to schedule on-site operator training for you and your people. Take advantage of more than 35 years of safety lifting experience and learn all the tips and tricks from a qualified PowerMate factory trained team member! Motor Maintenance & New Motor! With a commitment to continuous improvement, there are a number of product initiatives underway at L P Intentional Inc., the manufacturer of PowerMate. All of these initiatives are happening with the goal of making PowerMate even more efficient and maintaining their current, competitive pricing structure for their valued customers - both past and future! The second involves the introduction of a new motor for all PowerMate stair climbing hand trucks and soon: LiftGates! The introduction of the new motors to the PowerMate LiftGate Product line-up! All PowerMate stair climber models with a serial number greater than 36000 have and are being built with the new “dual-post” motor. The new motors are easily recognizable, they have two posts or terminals, unlike the single post grounded motor previously used. The new motors are insulated and do not require grounding to the stair climber or vehicle frame, as in the past. This very positive modification is just another example of PowerMate going the extra mile to ensure their customers receive the highest quality products and deliver the lowest total cost of ownership to their valued customers! Beyond the technological benefits, these motors have been tested and proven to deliver the performance and durability required to meet the highest standards PowerMate demands. What can I do to help prolong the life of my Motor? Follow the manufacturer recommended ball screw lubrication and maintenance instructions so your motor is not working harder than it needs to. Avoid overheating your motor. Increased excessive motor temperature can have the potential to shorten the life of your motor. Remember to keep your PowerMate plugged-in when not in use. Ensuring your motor has an adequate power supply, will allow it to run at optimal efficiency. For International customers, ensure you have identified the correct charger and voltage at time of order for your country. Not sure which is correct? PowerMate will be happy to assist you in determining the correct accessory. Adhere to the machine's recommended lifting capacities published in the Operating Manuals and the back of the all PowerMate machines, facing the operator. Use only PowerMate factory sourced parts in the repair and servicing your PowerMate. Avoid unnecessary equipment exposure to extreme humidity and water. These two elements can impact the life of the motor brushes. PowerMate motor brushes can be purchased and shipped complete with installation instructions along with a Preventative Maintenance Kit (PMK) available for all PowerMate stair climbers. To learn more about PMK’s, please contact PowerMate or your local PowerMate Partner. Lastly, be aware of the sound the PowerMate machine makes while “opening” and “closing” both empty and with a load. 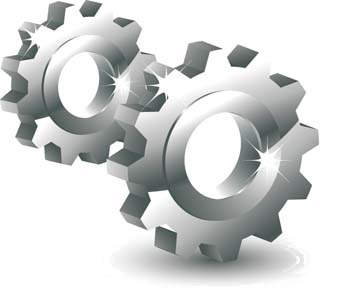 A noticeable change in the sound of the machine can indicate a potential service requirement. PowerMate invites you to follow them on social media to keep current on all the latest news and developments at L P International Inc. ! Smart Contractor Products - PowerMate Winner! 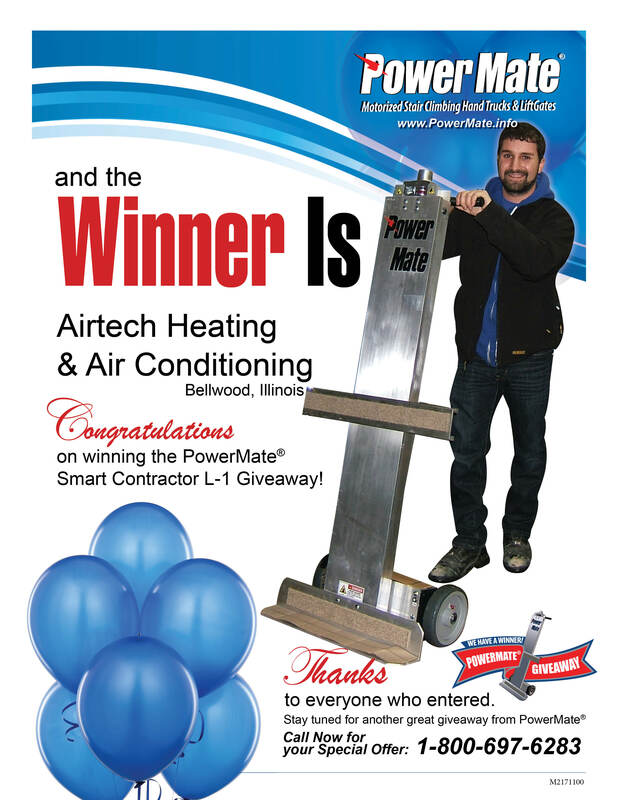 The most recent winner of the Smart Contractor Products FREE PowerMate® Give-Away of a Model L-1 for 2015 is: AIRTECH Heating & Air Conditioning Corp.
Congratulations! As a leader in the HVAC Industry, they are a highly customer-focused heating and air-conditioning company that was originally started in 1972. Located in Bellwood, IL, they employ highly trained people whose goal is to make their company the best service company in West Cook County and East DuPage County, IL.